With a blue sky, sunshine and comfortable temperatures, the weather had decided to be kind for the opening of the third edition of the U18 World Championship (for those under 18 years of age) in Braga, Portugal. But to have a hope of shining under the sun it was first of all necessary to overcome the pitfalls of the Qualifying Heats to be among the 34 finalists out of 71 Drivers. 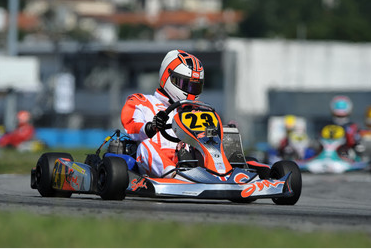 Henry Easthope (Sodi) was undeniably fast throughout the Portuguese weekend. In Qualifying Practice and in the Qualifying Heats, the Briton was never out of first place! His only fright came in the second Prefinal, contested from a reversed starting grid, when he was involved in an accident and relegated to the rear of the pack. He still managed to climb to 2nd on the grid for the Final, proving untouchable in the last confrontation, the most important. More than 3 seconds from the Briton, the battle for second place involved Charles Leclerc (ART GP) and the Frenchman Anthoine Hubert. After some superb overtaking manoeuvres, the Monegasque Driver, winner of the Academy Trophy last year, took the second step on the podium. In pole on the accumulated results of the two Prefinals, the Briton Ricky Collard, son of Robert Collard who races touring cars in Great Britain, slowly fell back but still scored points for 4th place after getting the better of his compatriots Benjamin Barnicoat and Sam Webster who like him were driving the ART GP chassis. The Top 10 was completed by the Italian Marco Maestranzi (PCR), the Australian Joseph Mawson (Top Kart), poorly rewarded for his speed after having to abandon one of the Prefinals, the Dane Martin Mortensen (FK) and the Russian Georgy Antonov (MS Kart). Rarely among the leaders, World Champion Matthew Graham (Zanardi) had to indulge in damage limitation to take 11th place at the chequered flag, better than the Frenchman Jules Gounon, who had every hope of being in the Top 10 before a collision on the first lap. He finally finished in 19th place. In addition to scoring points in the Final, Drivers had already banked some after the Qualifying Heats. After accumulating the two results, Henry Easthope leads the Championship ahead of four drivers on 3 points: Martin Mortensen, Charles Leclerc, Anthoine Hubert and Joseph Mawson. It promises to be a battle royal for the second Round of the U18 World Championship in Angerville (France) on the last weekend of August!